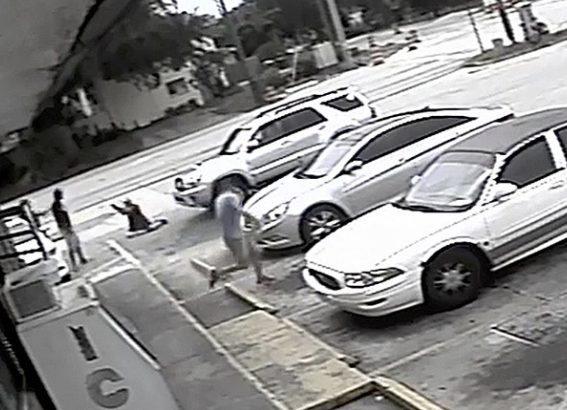 Recently in Clearwater Florida, in front of a convenience store, Michael Drejka shot and killed Markeis McGlockton. over an argument about the latter's girlfriend parking in a handicapped slot. (Google “FL convenience store parking spot shooting” for video links and comments.) At this writing, the local Sheriff has stated that Drejka would not be charged. A few days later, in Ft. Lauderdale, a man was stabbed to death in an argument over … a handicapped parking spot! The individual who killed him in this case has been charged with second-degree murder. Such “cautionary tales” as these offer much about which to inform us. When Drejka was surprised and body-slammed to the concrete, he had good reason to fear for his life. He was confronted by a much larger, immediately hostile man. Fortunately for him (as the video demonstrates) his head did not hit the pavement, which could have caused brain damage or death, but his upper body no doubt absorbed severe impact. While it is “obvious,” looking at the video, that McGlockton may have been starting to retreat, it is also “obvious” that from the ground, with tachypsychia–altering perception of time and space, Drejka may have still felt he was in danger of being killed … so he drew and fired. Could he – should he – have just drawn and not fired? If either the shooter or the deceased had rewound their behaviors leading up to the event, they might have achieved a level of clarity keeping them from initiating the cascading series of events that led to this arguably avoidable outcome. Reportedly, Drejka had engaged in altercations like this with others. Who appointed him guardian of parking slots in the public arena? What was the greatest potential gain he could expect to receive in relation to the possible downside for this kind of behavior? In other words, did he ever make a cost-benefit analysis? Is even the most remote possibility of having to kill someone over a parking space really worth it? As for McGlockton – was defending his girl friend's behavior by immediately and aggressively attacking Drejka really worth getting shot to death? Did he ever consider this outcome? Did he understand that, no matter how big you are, how “capable” in defending yourself, you can never really be certain of what you're going up against in a given situation? That the only way even a “black belt” can always win a fight is to not have it in the first place? The mantle of innocence, a legal/ethical concept which sometimes plays itself out in a courtroom, can help “parse out” guilt/innocence. If you're cut off in traffic, do you keep it going by tail-gating the offender, giving him the finger? Pulling off with him to the side of the road? If so, his guilt starts to drain away and yours edges up, because you have perpetuated the argument. If it ends up in a shootout/accident, you may be found partially at fault. In the convenience store discharge, a case can be made that progression toward DEFCON 1 unwound so quickly as to be almost irreversible, because of how both individuals had probably become accustomed to dealing with altercations. In other words, getting killed/killing someone over such a matter was pretty much baked in the cake because of a previous lack of reflection by these men as to what they might be willing to die for. This incident can be discussed until the cows come home. But reflecting on a few core elements goes a long way toward helping understand how arguing over a parking space, telling someone they should not litter on the street, asking someone to turn off their cell phone in a theater – and yes, in today's hyper-charged climate, accosting someone because they sport a hat, shirt, or bumper sticker with a political statement – can lead to injury, death, and enormous legal consequences. To listen to the podcast episode on this shooting, visit this page. I am a professional writer and life-long student of fishing, the martial arts, and shooting. I have trained extensively in sighted fire, and in (my in-close self defense preference being) point shooting. I actively study Professor Bradley Steiner's eclectic martial arts system of Jen do Tao (American Combato), which informs in the use of traditional, modern weapons and the empty hand. I also study the basic movement drills embodied in Grandmaster John Perkin's system of Guided Chaos. I believe that our Second Amendment rights can best be preserved by constantly seeking to improve our tactical skills, aligning them with the laws of the land, and being both willing and able to articulate our position to others, supported by solid facts. Just saw today (8/13/2018), that Michael Drejka was charged with manslaughter. This does not really surprise me, Mark. A powerful cautionary tale that avoidance – and looking ahead to what something might become is the safest, most effective strategy to follow. Even if he is able ultimately to “avoid the 12 carry” – the “all-in cost” to him is likely to be a heavy one.